My friends’ blogs. My first ever blogging friend was my girl Carrington at Organic Life Love. She gave me encouragement and support. She answered all my beginning blogger questions. She basically rocks. Carrington writes about creating a healthy home, healthy kids, and a healthy marriage. If you ever consider blogging, find a blogging friend. I found Carrington by accident, but it was a great accident. My friend Karis has a hilarious blog, too, called Candid Motherhood. She is perhaps one of the funniest chicks I know and she brilliantly wraps motherhood up into comic prose. Also, my friend Karen has a blog, with perhaps one of my favorite names around, called Only Sometimes Clever. She is a thoughtful writer and mother of five who shares wisdom, wit, faith, and recipes. P.S. I am also always on the hunt for new friends, so hit me up and we too could become blogging BFFs. Tent Blogger. This blog was recently launched by John Saddington, also known as Human 3rror. He is also the blogging dude behind ChurchCrunch and is involved with SoChurch (my husband’s company). He is a professional blogger and a Christian. Tent Blogger offers advice on why to start blogging, how to start blogging and more than that, how to make money by blogging. 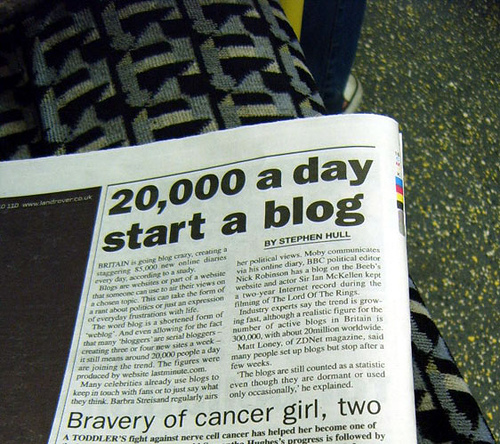 He gives readers challenges on how to improve their own blog, as well. I love that. ProBlogger. This blog is a beast, in that, it is massive. There is so much information here, from how to build an audience, to blog design, to improving your writing. It is my go-to source for all things blog related. Smashing Magazine. This blog has a whole slew of information that is beyond my level of comprehension, like coding. But beyond that, Smashing Magazine has some of the most gorgeous blogs on the Internet all lined up and ready for you to view. I spent many a night pouring over their pages as I was redesigning Modern Reject. The inspiration they provide is unparalleled. And if you just enjoy cool graphics and sweet design like I do, than you will want to check this site out. The blogosphere is a whole big world with plenty of uncharted territory. I still don’t know exactly what I am doing but I am having fun while I figure it out. Blogs can provide so much to an individual’s life, whether it is your personal daily blog , a professional news blog, or anything in between. 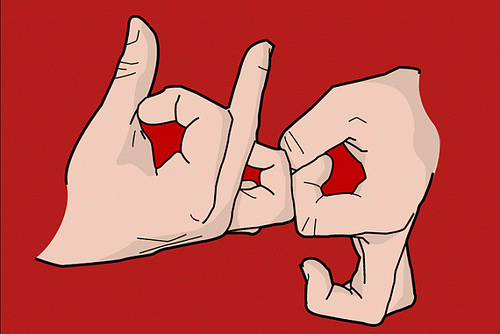 Blogging is definitely here to stay… so throw up your blog gang sign and get your blog on! Have you ever considered blogging but have never made the jump? What has held you back? Are you currently blogging? I would love to hear about your blog and check it out. Add a link to your blog in the comments and tell me a little bit about yourself. I’m a newbie at blogging and don’t fully get the bells and whistles for setting it up,etc. So if you check it out and notice something missing..PLEASE tell me. First, what are you wanting to accomplish with your writing? Who are you trying to reach? Or is this just a personal blog, helping you sort through your daily life? Also, I would change your main image, only because a lot of people have that image. If you want to stand out then maybe try something different. Your writing is pretty and very visual, since you are artistic. I like that. I found it to be welcoming and inviting in terms of content. Early 1994. A friend of mine got me into Myspace and said “why aren’t you blogging?” I started blogging and it’s been a roller-coaster ever since. My blog was far more active on Myspace because it was easier to control who did and didn’t read it (plus, you didn’t have to put a real name behind it). I’ve got a new one now called “A Laser Stun Production.” It’s basically me exposing the world for how stupid it is. Joey, First off, you are hilarious. I don’t know if you are writing just for yourself but more people should see your writing because it is good. I really loved the Concerning Job Interview Questions- so smart and witty. HAWT! thanks so much for the shoutout! You are so welcome. Thanks for the inspiration and the slick Standard Theme. I discovered your blog through Scott Williams on facebook/twitter. Enjoy your candid perspective and honesty. Check out my newly revamped site at voiceoftherevolution.com. Ryan, I checked out your blog. I dig. I love the grunge look and feel too since that is sorta my style. Thanks for sharing. I hope to see more of you around these parts as well. Hey! Thanks for the shout out. I look forward to connecting in Fee-to-the-Nics. Wait, did I tell you I’m the ultimate nerd? If not, I just proved it. Also, hit me up with your designers info. I SO need a blog re-do! It’s feeling as flat as my hair in humid weather. Help. I had to read Fee-to-the-Nics twice, before I got it…but I got it. :) Umm and there is no shame, I am a nerd too just in disguise as a normal girl. My designer is Jon Ashcroft. His site is, no surprise, http://jonashcroft.com/. He mostly does print design but is moving more into web. P.S. I like your blog design, although you see it everyday, so I understand. It’s like a pair of shoes in the closet, still cute, still wearable but sometimes a girl just wants to buy a new pair. Thanks for stopping by and commenting! See you in AZ. Hey there. As you might know, I have The Minor Prophet blog that I do. Been doing it for YEARS now, but only recently started to take it more seriously. Still learning a lot, so it’s certainly a work in progress. Thanks for all you do! Love reading your blog! Josh, I’m glad to know you are moving more into the serious direction with your blog. You have some great content. I stop by. Sorry I don’t comment. I’ll try and do that more. And you have such a great blog name! I’m still learning too. I’ve only been doing this for 5 months. Weird. It feels like 2 years. I don’t know if that is a good thing or a bad thing. Thanks for reading and supporting MR too. You rock! Great post, Nicole! You turned me on to some sweet blogs that I hadn’t had a chance to read yet. I really enjoy TentBlogger and In the Name of Love! Kenny, I’m glad you maybe found some new blogs to check out. You too post some great leadership content on your blog. Good stuff. You’re my favorite. I heart you. With or without the link love. Thanks lady! I’ve had a crush on you since we first met…. Hopefully sometime this weekend I can get a minute and go through your favorite sites! This is my absolute favorite thing- to get recommendations on sites- love it! Thank you for your sweet words, I adore you! I’ve been blogging for years at Comma Dot Comma but for the past several months the blog has become mainly a baby blog since all my family and most of my friends live far, far away from their only granddaughter/niece/child of friend. I want to change my theme– I have a friend who updates all that stuff for me and gives me server space, but I usually try not to bug him. I wish I had blogged as my children were born. It would be so wonderful to have a record of their first little experiences, and mine as well. I love your blog description:on the omphaloskepsis bandwagon. You have a unique wisdom and wit in your writing. I like it very much. I have always dreamed of travelling the world volunteering and blogging about it. Several things have kept us from actually doing it but I am not giving up on my dream. It is an awesome blog (I should have added it to my list). He quit working to travel around the world and create change through volunteering. He tells people how to do the same and challenges the staus quo thinking of needing a 9 to 5, to live. I will be one of your biggest fans and readers when you get there. It is an awesome dream, don’t give it up! hi!This was a really magnificentsuper blog! Thanks for the kind words and for commenting. I hope to see you around here again! Previous Previous post: The Easy Way or the Hard Way?